"This tasty treat is quick and easy to make. 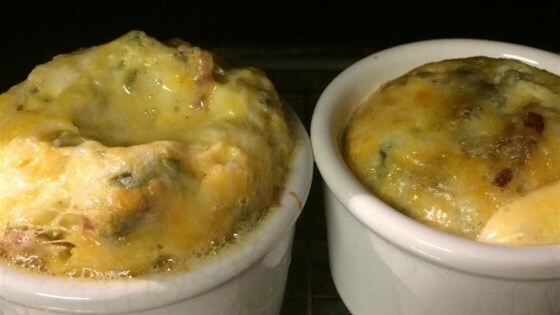 Jalapeno peppers are baked into a cheese blend. Sausage or ham may be added to the mixture. It can be made ahead of time and frozen." Whip the eggs in a small bowl and pour into the baking dish. Layer with jalapenos. Top jalapenos with the cheese. Top cheese with more jalapenos. Bake in the preheated oven 30 minutes, or until the cheese is bubbly and lightly brown. I added left over sausage or bacon. This is simple and delecious!!! I am making breakfast to take to eat at work, so no picture! I warmed this up then put it on a toasted bagle and today I am goign to put it on some toast!!! a little bland, but im sure it wouldnt be hard to flavor this up. its a good starting point. a few drops of franks helped. Good, but mine came out too skinny. I'll add more eggs next time. I chopped the jalapenos & mixed everything together. Good, easy breakfast.